Bauer Technologies were recently contracted by Sisk Lagan JV, the main contractor, to complete the foundations work for the A19/A1058 Junction Improvement in Newcastle. 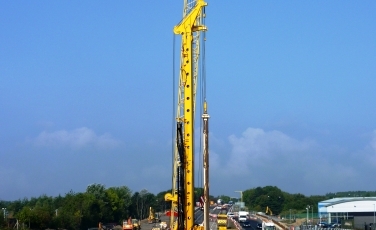 The project involved the installation of 583 contiguous rotary bored piles with diameters ranging from 600mm to 1500mm. The piles, which are up to 31m long, are founded in sandstone bedrock to form contiguous pile walls, creating the trough for the future A19 ‘dive under’. A number of the retaining wall piles also act as hybrid design elements by carrying the load of three major single span bridges across the underpass. In order to verify the capacity of these critical foundations, Bauer carried out three permanent pile load tests using the innovative Osterberg method. The aim of the improvements to the existing A19/A1058 Coast Road junction, is to support opportunities and economic growth in the North East. The £75m scheme involves the upgrade of the existing roundabout to an ambitious three-level interchange. The project is particularly challenging as it involves Bauer working within a live, major roundabout with a heavy volume of traffic. In order to manage the associated risks efficiently, Bauer is working closely with SLJV, the main contractor, and the client, Highways England to implement stringent health and safety processes. In addition Bauer is enthusiastically participating in Highways England’s “Raising the Bar” scheme, which is designed to raise standards in Efficiency, Quality and Health and Safety. The project started in July 2016 and is due to finish at the end of 2018.